OPI Summer 2011: Nice Stems! 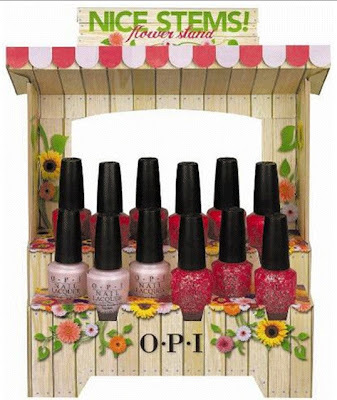 Here's a look at OPI's Summer Collection, Nice Stems! This is scheduled for a June 2011 release. I Lily Love You and Come to Poppy are my favorites! I'm not a big fan of pinks but I'm gonna have to get Come to Poppy since that's my daughters name! My sister's name is Lily so I guess i'll have to get it for her! Ohh! I almost never wear pinks, but these do look really cute! :) I might pick them up (though the glitter's deffo gonna be mine). JESUS! all those pink! i must have them all!!! Play the Peonies I'll have to see swatched. The rest I'm excited about. I can't wait to see swatches of I Lily Love You! i'm so sick of OPI doing pinks :( thank you for the post though, i appreciate the sneak peek! I'm so obssesed with pink lately. Can't wait to get my hands on a few of these! !